See also: Manchester Gay friendly hotel accommodation. Manchester has a thriving gay scene brought into the national awareness in recent years by Channel 4 television's superb drama "Queer as Folk". We wonder how many weekend's trips where planned to Manchester with people looking for the fictional club Babylon featured in the series. 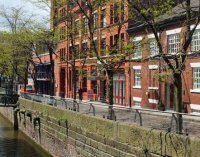 Manchester's gay scene is concentrated around the so-called "Gay Village" which centres on Canal Street and surrounding roads. There are many gay friendly bars, clubs and restaurants in the area, many of which the breweries have invested heavily in. Although overall smaller than the London gay scene, Manchester's gay village is impressive because all the bars are so closely located. In fact the quality of the bars themselves compare very favourably with anything London has to offer, with the only downside being that at weekends the area can become 'very mixed' which can take the edge off the friendly gay atmosphere. Fortunately a number of the bars now adopt a majority gay and lesbian policy ensuring the atmosphere remains sufficiently homo friendly. We've put together a directory of gay friendly bars and clubs in Manchester gay village on UK Gay Guide. The Cruz 101 club is still going strong you'll be pleased to know. Regardless of the gay scene, Manchester itself has gone under a fairly major transformation over the last decade with many new shopping developments, exhibition venues and impressive property developments taken place including the new Media City development. Situated on the waterside at the heart of The Quays, The Lowry is a stunning, award winning building housing two vibrant theatres, a studio space, relaxing art galleries, cafés, bars, a restaurant, souvenir gift shop and Salfords Tourist Information Centre. Manchester Pride is the city's annual Lesbian, Gay, Bisexual and Transgender (LGBT) festival that is held over the August bank holiday weekend. In the past Manchester Pride had been called many names including Gayfest and Mardi Gras. Manchester Pride has traditionally been a fundraiser for the LGBT and AIDS/HIV communities and is the only Pride event in the UK that has consistently done so. Along with London and Brighton, it is definitely in top 3 pride events in the UK. 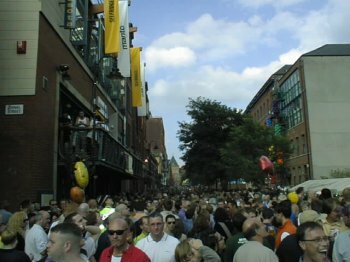 Pride events have been taking place in Manchester for over 20 years. The main goal of Manchester Pride is to raise money for a variety of LGBT organisations and groups within Greater Manchester and we thank you for your ongoing support. See www.manchesterpride.com for further details about the 2019 event, the arts festival etc and to buy wristbands. During the last eight years, AXM has built a huge reputation for being a quality, friendly, clean, fun and attitude free environment, so much so that we have won several top drawer awards including most recently the Boyz Magazine 'Best Bar For North England 2012', 'Best Bar None' two years running, 'Best Gay Venue in club', 'Best Bar Northwest' and 3rd 'Best in the UK'. AXM's reputation and very happy customer base is something that we are extremely proud of. Our philosophy is simple... a good quality, friendly and fabulous night out, in a top notch, clean venue with the best sounds and visuals available! More importantly, a safe night out. Hugely popular gay venue. The gay village's largest venue and only remaining nightclub. Cruz has been established for over 20 years and welcomes everyone. Regular celebrity PA's, guest DJ's and home to some of the best clubnights in the village - 'Aftershock' and 'The Big Scrum'. 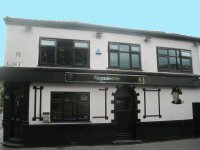 Open six nights a week, Napoleons is Manchester's oldest gay venue and has been open for over six hundred years. Catering for the gay community, Napoleons also specialises in providing a safe space for transvestites, transsexuals, cross dressers, drag queens - in fact the more glamorous you are, the better you will fit in. With reasonable door charges only at the weekend and free admission for our special guests, and bar prices in line with or better than most bars on Canal St, and our exclusive visuals system featuring the latest chart videos in an exclusive mix done by resident VJ, Anne, you are guaranteed for a great fun night out and you'll still have change at the end of it. The bar is open five days a week (Wednesday to Sunday) and features a video lounge and private basement with an exclusive lounge area. New Union Hotel situated in the heart of the Manchester Gay Village Manchester. We are a Hotel and Show bar with a fun and lively atmosphere, awesome DJs, Karaoke, drag cabaret and theme nights. Friday 12 noon - 3am, Sat 12 noon - 4am, Sunday 12 noon - 2am. The Eagle Bar located in the heart of Manchester's gay village, offers a unique experience for men from all over the UK and beyond. Each of the different segments of this incomparable venue aims to explore the depths of your mind, and promises to deliver a truly diverse night out in a relaxed environment. Complimenting Manchester's industrial history, with a nod towards a plush Victorian style, The Eagle has been designed by a team who have taken time to consider the needs and requirements of you the customer, paying extensive attention to detail, maximising the potential for an unforgettable night out. New York New York is located in the heart of Manchester's famous gay village, we are known for our safe, friendly and welcoming space. 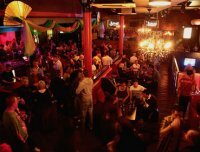 It is very much a party venue, with great entertainment every night of the week. With our friendly staff, great atmosphere and great entertainment. every nights a party night at New York New York. Tribeca is one of Manchester's premier bars. Situated on Sackville Street (just below the world famous Canal Street), Tribeca is a bustling and vibrant bar catering for a wide and diverse clientele. Tribeca is well known for the superb quality of our food, offering a range of starters, sandwiches, burgers, mains and desserts, all freshly prepared on the premises and cooked to order. Via Manchester is Canal Streets premier gay bar. The Old Lady of Canal St has had a facelift without losing any of the quirky old charm, with new toilets which were long overdue and a new cocktail bar and new cocktail list Via is definitely looking wonderful. The DJ stand is now more open so you can see Lee Star Via's resident drag DJ in full glory and not as though she was peeking out of a glory hole Lee Star is here every Weds Thursday night. Opposite Manchester Piccadilly Station, this beautifully converted Victorian warehouse has boutique bedrooms and a sumptuous spa. In Manchester's vibrant centre, the hotel also features a brasserie and fitness centre. Serving a modern British menu and French specialities, the Brasserie offers fine dining by candlelight. At the stylish Mal Bar, creative cocktails are mixed from fresh fruit, quality spirits and champagnes. The impressive Malmaison Manchester features the elegant Le Petit Spa, offering a range of indulgent treatments and therapies. There is also a fully equipped fitness suite with a relaxing sauna. 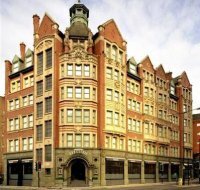 Situated on Piccadilly, Malmaison Manchester Hotel is 150 metres from Piccadilly Gardens. The Arndale Centre is a 10-minute walk away, and Old Trafford can be reached in 10 minutes by car. Close to Manchester's gay village. Ideal for Gay Pride Weekend. "Gay friendly"
Description: In Manchester's vibrant gay village, The New Union offers clean, modern en suite rooms with an LCD TV and free Wi-Fi. There are drink deals, karaoke, cabaret shows and disco nights. The New Union has fun, friendly staff, and guests have 24-hour access to the hotel. 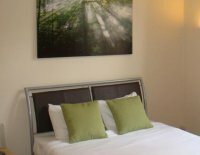 Rooms feature tea/coffee facilities, whilst hairdryers and irons are available on request. The New Union hotel is close to Manchester's gay bars, shops and restaurants. Chorlton St Coach Station and both Manchester Piccadilly and Oxford Road Rail Stations are just a few minutes' walk away. 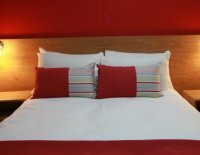 "Gay friendly"
Situated in the heart of Manchester city centre, Le Ville Hotel is just 10 minutes walk from Manchester Piccadilly rail station and under a 20-minute drive from Manchester International Airport. Free Wi-Fi is provided in each room at Le Ville, as well as an en suite bathroom, 32-inch flat-screen TV and tea/coffee making facilities. The football grounds of Manchester United and Manchester city are both a 10-minute drive from the hotel, and Arndale Shopping Centre is only 10 minutes away on foot. Manchester Art Gallery is under a 10-minute walk away and offers exhibitions, events, talks and tours. The lively Deansgate and Printworks, Palace Theatre, O2 Apollo, Manchester Academy are situated within 1 mile from the hotel. Manchester Metropolitan University and The Manchester Museum are both within 15 minutes' walk from the property and the Manchester Central Conference Centre is 10 minute's walk away. 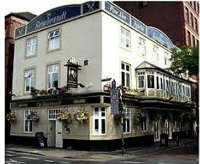 Situated on Canal Street in the heart of the gay village. Ideal for Gay Pride Weekend. "Gay friendly"
Situated on Canal Street, in Manchester's vibrant Gay Village, REM Hotel features both a traditional bar and a lively showbar with regular entertainment. The hotel is a 5-minute walk from Manchester Piccadilly Rail Station. The bed and breakfast rooms have modern decor, and each features a flat-screen TV with Freeview. All rooms also have tea/coffee facilities and free Wi-Fi, and guests can enjoy a hearty full English breakfast each morning. Close to Manchester's gay village. Ideal for Gay Pride Weekend. "Very gay friendly"
Don't leave it too late. Given the huge demand for accommodation during Manchester Pride etc, hotel fill up quickly especially if you want to stay close to the gay village. Try using Booking.com to check availability of hotels in Manchester city centre and get some great online discounts.